Yesterday was a windy garbage day, so there were papers from spilled trash cans blowing around the neighborhood. Some poor kid's homework went from backpack to fridge to garbage can (perhaps surpassing the fridge) and ended up...yep, here on my blog, because sometimes I'm a bad person. As you can see, Hannah did very well on her recent spelling test (Lesson 28 with a smiley face), receiving both a "bravo" and a darling little frog sticker. 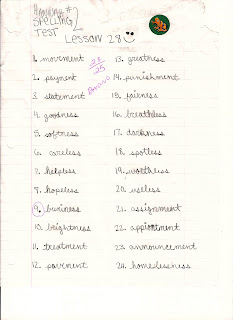 Unfortunately, her teacher missed a mistake on number 22: "Appiontment." Let's just hope Hannah doesn't one day wind up a receptionist for a doctor or dentist. But overall, a great showing. Bravo indeed! I think I'll put Hannah's test on the fridge and pretend I have a very quiet, independent fourth or fifth grader. Later, another escaped assignment ended up on my lawn: a worksheet about Laura Ingalls Wilder. Beats the litter I found when I cleaned out my flower beds--a sun-bleached wrapper for "American High School Musical flavored fruit snacks." If anyone knows what "American High School Musical" tastes like, I don't really want to know. But I'm going to guess it's something like a cross between Sunny Delight, sweaty gym socks, Tortino's pizza rolls, and Proactiv cleanser. You must live in a good neighborhood. My kid doesn't get a bravo or even a good job. He gets a, "Take a shower, you smell." I don't get it! I'm kind of surprised they still make kids write in cursive. That is some pretty tame litter.